villa on the exclusive in a prestigious area of Granada has been furnished to an extremely high standard and has all modern facilities required for a relaxing holiday with private pool are for the use of property residents to relax after a long trip visiting our city on the large sun terrace for breakfast, lunch or dinner, a ideal place with hammocks for lazing and sunbathing all day in the garden. The large lounge is furnished with two comfortable sofas,dinning table for 6 people, coffee table and two side tables with cozy lamps with log fire for a tranquil and romantic evening, a high definition TV ,42' to connect to the satellite (european) in the country, DVD player and music player. a information kit of Granada and Andalusia in general will find the places to go eat, restaurants and free tapas bars, shopping and also visit all the places of interest to you, as well as books or novels of Granada, tourist information with maps. 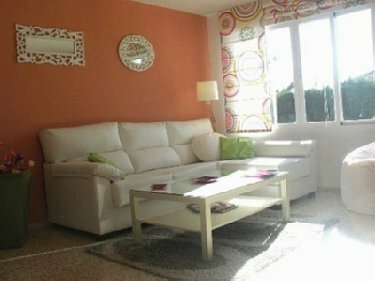 Detached 3 bedrooms tastefully furnished, luxury and comfort with good mattresses for viscoelastic relaxation,The master bedroom has one double bed, with sheets, duvets and pillows. The rooms are exterior with large windows and views. For those of you with young children,there is a highchair and baby stroller and travel cot (with linen) available on request for your use. Two bedroom with four single beds which can be used together or separately and can be configured as doubles,with sheets, duvets and pillows. All bedrooms have spacious fitted wardrobes with drawers.1 Floor: bathroom comprises of his and her sinks, toilet and bath with shower over. ground floor: toilet and wash hand basin, hairdryer, toilet paper,soap, towel set, There is a hair dryer in each bathroom. fully fitted kitchen with all appliances,plate 4 fires, oven, microwave,,fridge-freezer, dishwasher, washer,mixer, coffee pot, toaster, in fact everything needed to make your holiday accommodation as comfortable as possible. Sunny all day because the property faces South. Outside: terrace ,balcony, patio, open terrace furniture with sun loungers and parasols, garden table and chairs sets, barbecue, parking, garage,Outdoor Shower,charcoal BBQ, outdoor shower, private pool open all year. A fantastic home for your vacation with your family or friends. 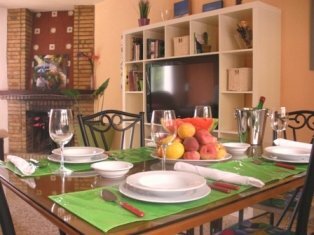 Choosing of our house wonderful in Granada will ensure you thoroughly enjoy your visit to this historic Spanish city. This wonderful Andalusian city with its Moorish heritage is a fascinating city to visit, and choosing our house in Granada will only increase your enjoyment of this marvellous Spanish city. Few cities enjoy such an historical background with so many monuments, it is not a city that can be visited quickly, the Alhambra palaces and Generalife alone would take the best part of a day also boasts a fantastics tropical beachs. The energy and streets atmosphere along with the upbeat personality of it's people, make Granada a dynamic and very popular city because you will love it!. - a refundable damage deposit € 50 is returned upon departure. - Balance to be paid - On booking to arrival.